As part of a refurbishment project in the Sydney CBD, core drilling of concrete walls was required for new mechanical penetrations. Prior to coring however, the structural engineer required the location and marking of the reinforcing steel (reo) inside the walls in order to preserve structural integrity and prevent damage to the building. 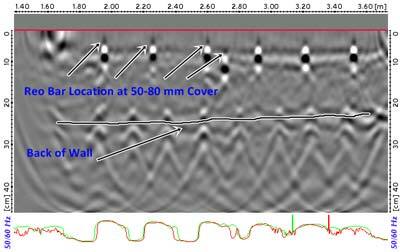 Concrete Scanning Services developed a plan to survey each of the wall subsurfaces by using the CX12 Ground Penetrating Radar with 2D and 3D capabilities. 18 locations of 200mm thick walls were scanned on five different floors. A 300mm x 300mm area around each location was targeted to allow for core drilling adjustments. Scans were completed with the 1.6GHz antenna which provides a good balance between resolution and depth penetration. Due to accessibility issues, 11 of the 18 areas had to be scanned using an elevating work platform (EWP). In each area, the locations of the reinforcement steel were clearly identified and marked to provide complete confidence in their whereabouts. 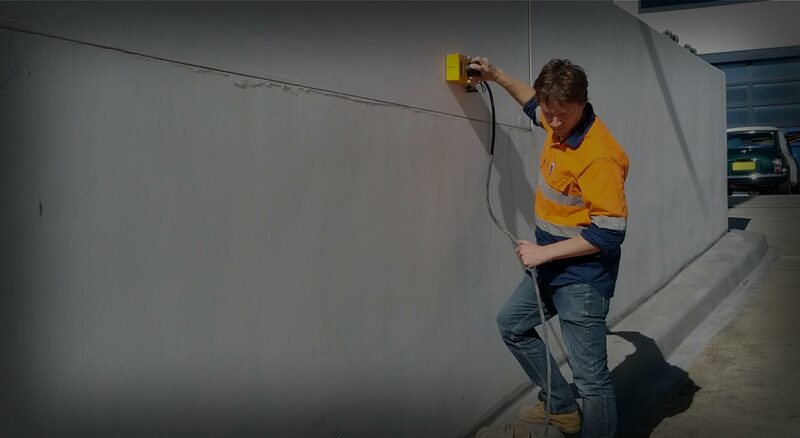 After locating and verifying all of the steel reinforcements, Concrete Scanning Services provided a survey report in addition to marking all the reo detected in each scan location. These markings clearly indicated areas free of reinforcement where the new core holes could be drilled. The client was able to complete the drilling without damaging any reinforcement steel.